A small parcel of conservation land, owned and maintained by the Massachusetts Audubon Society. Although the entrance is in Hopkinton, about half of the property is in Holliston. The trails lead to a pond - created long ago when it was farmland - by the farmer who dammed the stream running through the property. The pond is now home to beavers, who can frequently be observed working on their lodges and swimming in the pond. 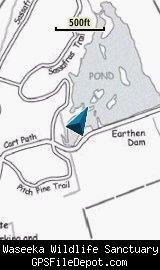 This KMZ map is set to Draw Order 25 so it will show 'beneath' your primary map (and also 'beneath' my 'Ashland State Park' KMZ <http://www.gpsfiledepot.com/maps/view/572/>) on your Garmin KMZ-compatible GPS. These two maps overlap, but by having Waseeka 'beneath' Ashland State Park, you can have both on your GPS at the same time and not have any important trail features obscured. 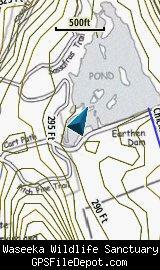 Initial release using undated Mass Audubon map downloaded on 2012 Feb 26.